A colourfully landscaped garden is only as enchanting as the amount of effort that has gone into designing it. The same applies to garden ponds and the addition of aquatic plants to create a bespoke water feature. There are a wide range of pond plants available on the market. Plant varieties all have their own specific requirements such as amount of light, substrate type and growing conditions. Maximum size is also an important feature worth noting. The three basic aquatic plant types: submerged (also known as oxygenators), marginal and floating. It is a good idea to incorporate planting shelves into your pond design if you plan on adding marginal and submerged plants. Colour, height, texture and planting conditions all need to be well researched to create great visual interest. How you combine plant attributes will give you the aquatic landscape you envisage. To incorporate a range of aquatic plants you need to add planting shelves at various depths. Submerged and marginal plants will need planting in a special pond basket before securing in place on a planting shelf. Use washed gravel to plant in rather than soil. Pond plants are able to have their nutritional needs met from decomposing fish food and fish waste. If fish aren’t present and nutrient are levels low, add in a liquid fertiliser designed specifically for pond plants. When choosing planting pots, avoid choosing those with a bottom drainage hole. Soil will leach out of the pot adding nutrients to the water, which will then lead to an increase in algae growth. The same applies to the use of plastic mesh baskets unless you line them with cut-offs of Geotextile underlay or hessian. Both materials will stop soil leaching out while allowing continuous water, gas and air movement to pass over the plant roots. Planting pots without a drainage hole work well provided the water level of the pond is kept above the surface of the pot. Add a gravel top layer to stop soil leaching out. To plant, add aquatic soil to your chosen pot. This will help to anchor your plant in place and holds nutrients for healthy growth. Pots stop plants getting too big and invasive. 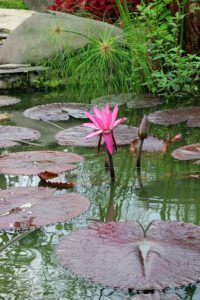 Aquatic plants provide shade and use up nutrients in the water to help maintain a healthy, well oxygenated, clean pond and they control levels of algae growth. Add aquatic plants to your pond between mid-spring to early summer. This entry was posted on October 19, 2018, in Garden ponds. Bookmark the permalink.